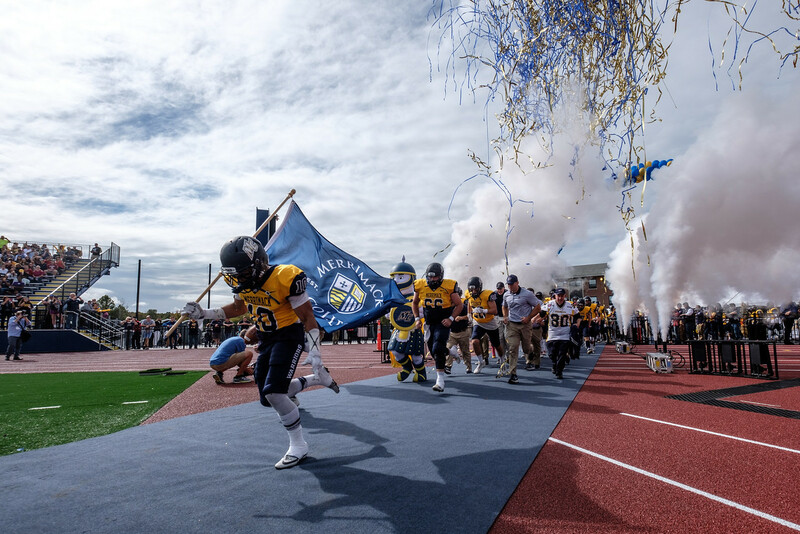 Merrimack makes a bold and large step towards becoming a more prominent school by accepting the invitation to join the Division I Northeast Conference. Becoming the eleventh team in the division, Merrimack is ahead of schedule in its Agenda for Distinction, a 10-year strategic plan created seven years ago by the college to become a more modern and selective Augustinian Catholic institution. The college will become a full member of the DI conference in 2021-24 after the completion of a four year NCAA Division I reclassification period. Offering 10 men and 14 women’s sports teams from men’s and women’s basketball to football and women’s volleyball, the remaining 22 teams will move from the NCAA Division II level and join men and women’s ice hockey as Division I programs, but with hockey remaining in Hockey East. This change directly impacts many players currently in the program, with current athlete’s standpoints and feelings towards the adjustment varying. “The school should have individual meetings with every sport to answer all questions the athletes have, and discuss with these players the new world they are being brought into and the changes within each and every program,” says Emily Maer, a fifth year player on the women’s soccer team who transferred from UConn after her freshman year to Merrimack, and has experienced both a DI and a DII program. Maer believes that the transition is going to be a challenge, since some of Merrimack’s teams are used to being at the top, but will be introduced to a different game of play and be put through a learning experience from the transition. Positive feeling resound within the athletic community presently in Merrimack, with the accomplishment of playing at the most elite level in college being a huge draw to current program athletes. Teams will not only gain more recognition but will improve and grow, taking a leap as a school overall and changing the way Merrimack athletics are today. This change demonstrates how this smaller Augustinian Catholic institution is looking to make waves, and to not only become bigger and more prominent, but to gain more attention and coverage. Suech, a player who had a hand in the baseball team’s NE10 championship in 2018, understands what the change that will ensue, from the longer travel hours and longer preseason to the rebalancing of academic and athletic time management among the players. Suech is also concerned about the baseball field situation, wondering if the newly DI program would ever gain a home field to host rather than traveling off campus for every practice and game. Merrimack will sponsor 21 of the NEC’s 23 sports starting in 2019-2020, excluding only men’s golf and women’s bowling, and will be included in the NEC schedule starting next school year. However, due to the the reclassification period, only NCAA non-automatic qualifier sports can participate in the NEC championships, which only includes cross country, swimming and diving, and indoor and outdoor track. All other sports will not be able to qualify until 2023-24. This is one of the biggest drawbacks of the division change cited among athletes. The majority of sports will not be allowed to make postseason play until almost all of the current athletes have graduated, only being allowed the opportunity to make postseason in 2018 (the current season). Part of the Northeast-10 Conference since 1984, Merrimack prospered majorly in 2017-18 with winning the NCAA DII men’s lacrosse national championship as well as three NE10 championships with baseball, men’s lacrosse, and men’s soccer. Seven teams also qualified for the NCAA tournament: baseball, men’s basketball, men’s cross country, men’s lacrosse, men’s soccer, softball, and men’s tennis. This is a school record thus far, on top of Merrimack winning the 2017-18 NE10 Presidents’ Cup, an award given annually to the top athletics program in the NE10 league made up of 15 institutions.